1 Suppose you needed to move an object. You might use tools to help you. Machines are tools that use energy to do work. Simple machines are machines with a few or no moving parts. Machines make work easier. 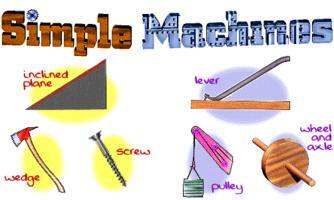 You probably have used several of the six different kinds of simple machines. 2 Pretend you need to lift a heavy object like a big rock. You could use a lever to help you. A lever is a simple machine made of a board that is used to move objects. A seesaw or teeter-totter is really a lever. The middle of the seesaw has something under it to hold it up. This is called the fulcrum. The lever moves back and forth on the fulcrum. On a seesaw, each person takes turns lifting the other person. 3 To lift a rock with a lever, you would need a board to be the lever and a fulcrum to hold it up. Another rock can be a fulcrum. The object being lifted is called the load. You can lift a load most easily by moving the fulcrum close to the load. You move the load by pushing down on the end of the lever. 4 A hammer is another kind of lever. A hammer pulls a nail out of a piece of wood. Where is the fulcrum on a hammer? 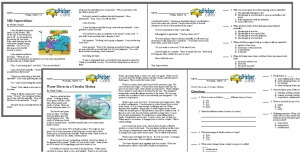 Feedback on What Are Simple Machines?